Well, if you’re one of the Three Little Pigs, you probably are — and with good reason! But if that doesn’t happen to be your situation 😉 , then you have no reason to fear stepping right up to the brand new B.B. Wolf’s Sausage Co. kiosk — especially if you’re in the mood for the house specialty! 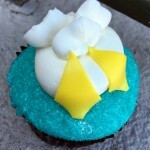 But we were able to happen upon a soft opening today! Prior to official openings, sometimes new Disney World eateries will host soft openings to give the Cast some practice and work out any possible kinks (this also means that the spot is not guaranteed to be in operation at any given time until it officially opens on May 15th). With more than a wink and a nod to the story of The Three Little Pigs — which Walt Disney produced as a Silly Symphony short film in 1933 — B.B. 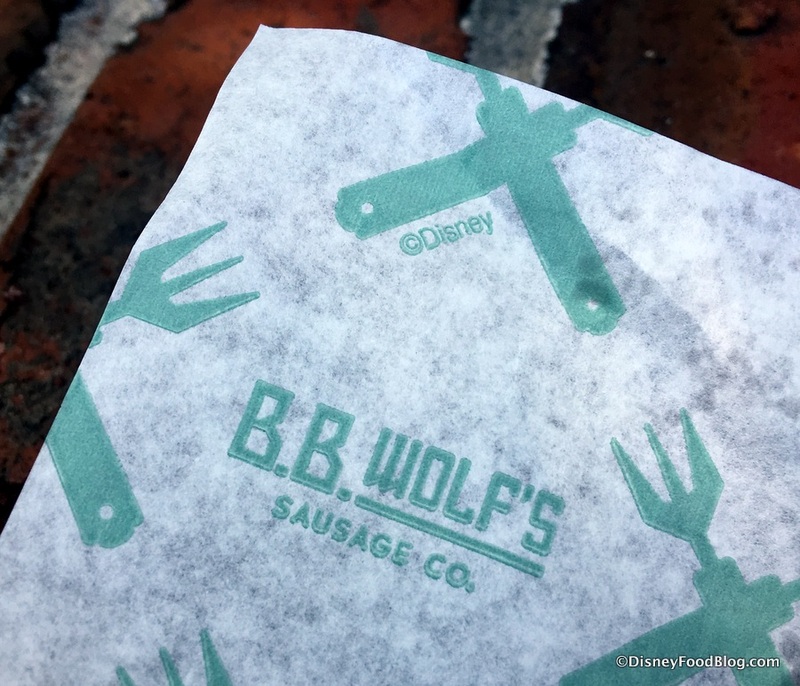 Wolf’s Sausage Co. is serving up Artisan Sausages to Disney Springs guests. Before that Big Bad Wolf huffs, and he puffs, and he blows this house down, let’s check out new B.B. 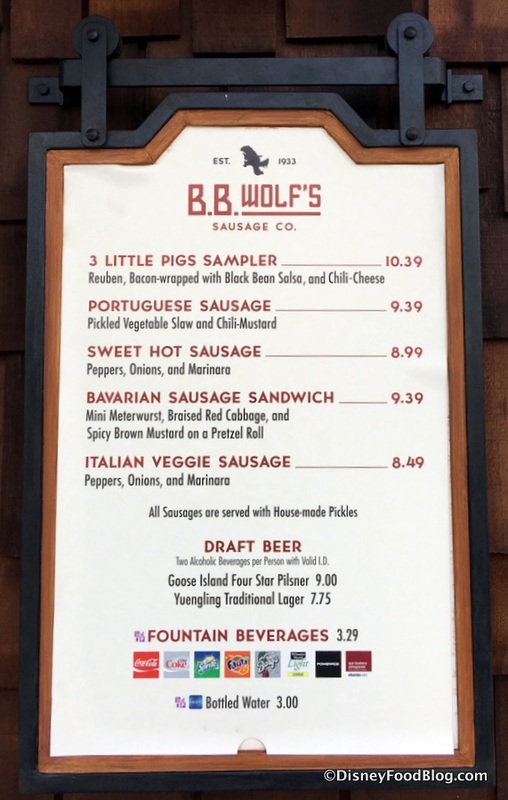 Wolf’s Sausage Co.! B.B. 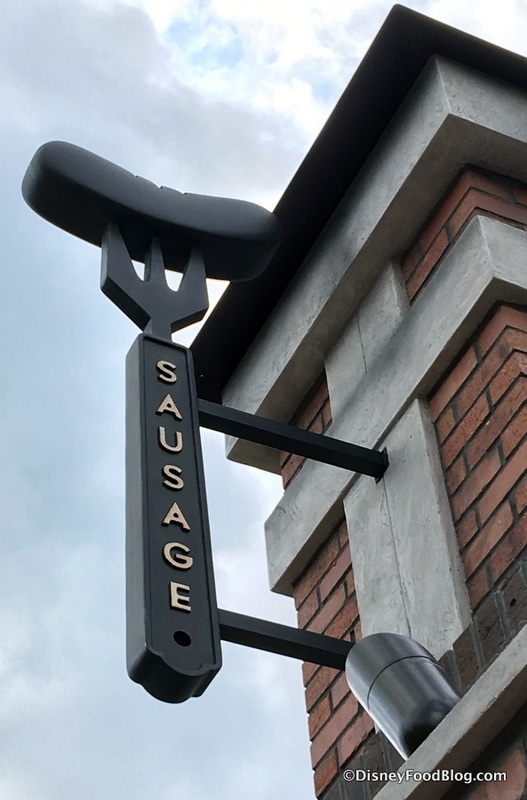 Wolf’s Sausage Co. is located in the Marketplace of Disney Springs, right near the spot formerly known as Fulton’s Crab House (which will be transformed into Paddlefish when the location reopens this fall). Looks like the Big Bad Wolf decided against straw or sticks for his new place, opting instead for more of a wooden panel siding. In the Silly Symphony, the Wolf tries to enter the house through the chimney to get at those pigs in the house made of brick. So the addition of a brick chimney here is a fun touch! 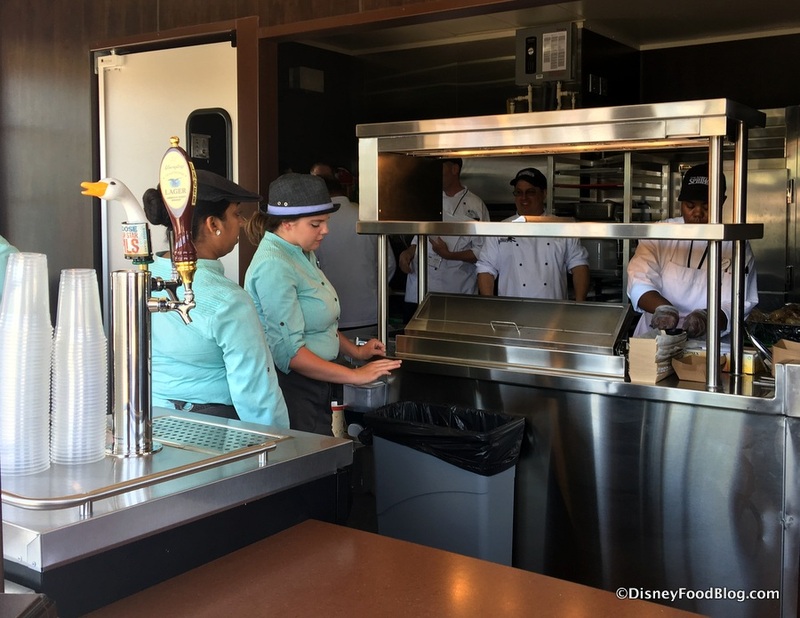 Even within this small setting, there are still fun things to see — primarily, the open kitchen where you can watch the food preparation in progress (and check out those cool Pork Pie — natch — hats on the Cast Members handling the orders 🙂 ). 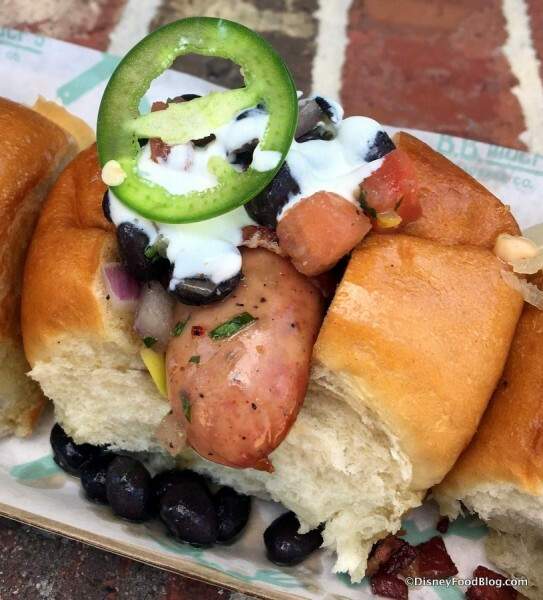 A variety of artisan sausages make up the menu at B.B. Wolf’s Sausage Co. Options include The 3 Little Pigs Sampler (Ha!) 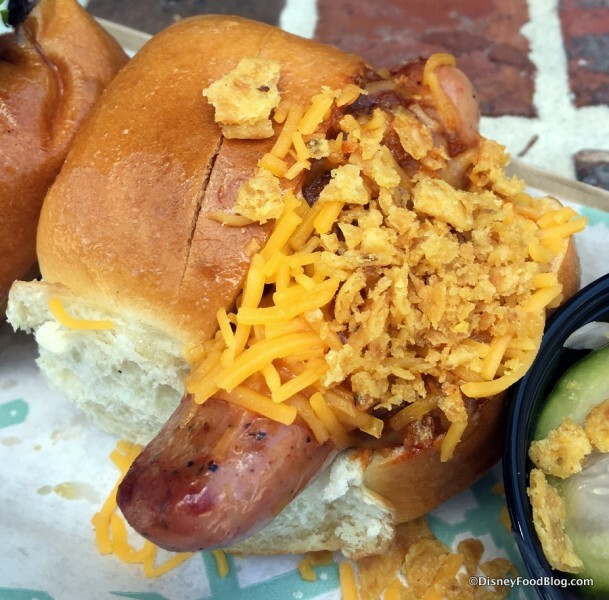 which comes with a Reuben Sausage, a Bacon-wrapped with Black Bean Salsa Sausage, and a Chili-Cheese Sausage. For individual sale are a Portuguese Sausage (topped with with a pickled vegetable slaw and chili mustard), a Sweet Hot Sausage (featuring peppers, onions, and marinara), an Italian Veggie Sausage (also served with peppers, onions, and marinara), and a Bavarian Sausage Sandwich (which you’d better believe we’ll be digging into shortly 😉 ). Draft Beer (Goose Island Four Star Pilsner and Yuengling Traditional Lager) and an assortment of soda and bottled water make up the drink options. 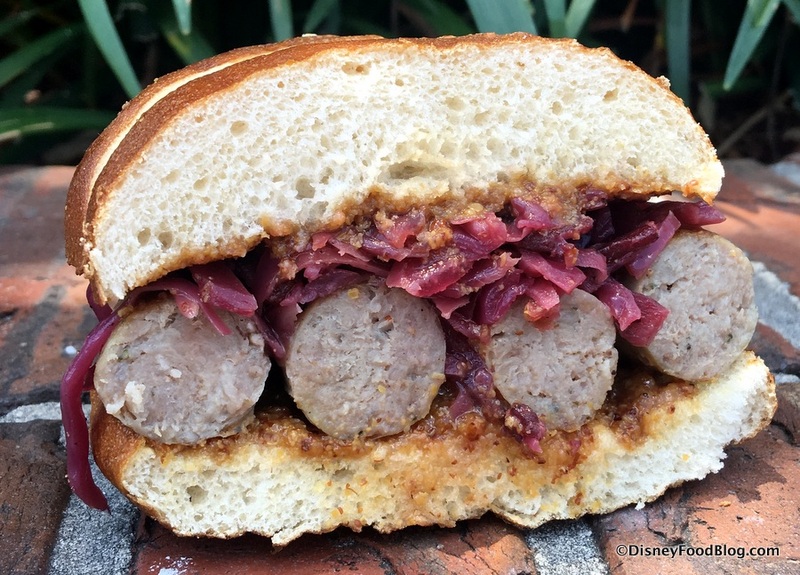 As for our order, the Cast Member helping us recommended two choices in particular: the 3 Little Pigs Sampler and the Bavarian Sausage Sandwich (which we were already intrigued by, due to the promise of a Pretzel Roll!). Let’s start with that 3 Little Pigs Sampler. Down the line you’ll see them in the same order as listed on the menu: the Reuben, the Bacon-wrapped with Black Bean Salsa, and the Chili-Cheese. 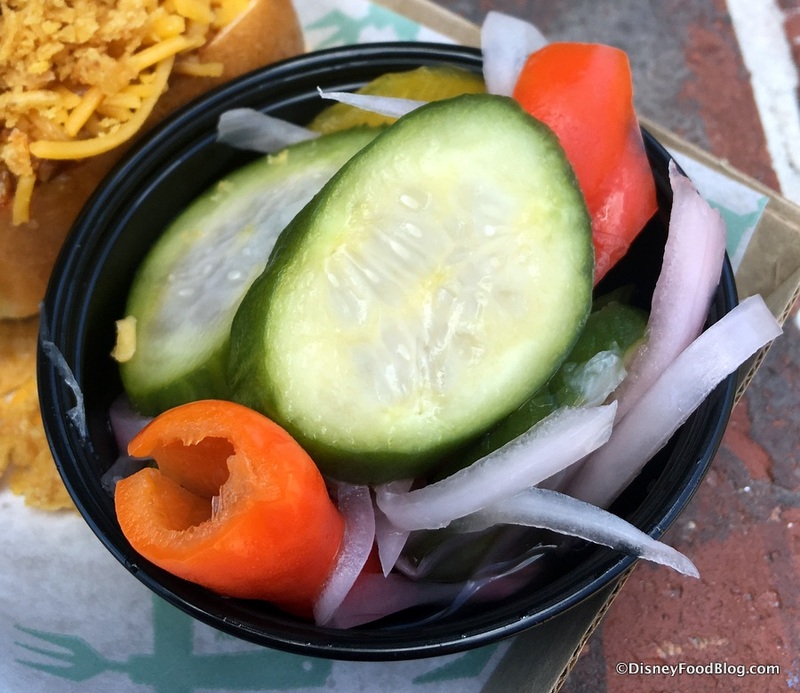 Like all of the dishes at the kiosk, the Sampler is served with housemade pickles. 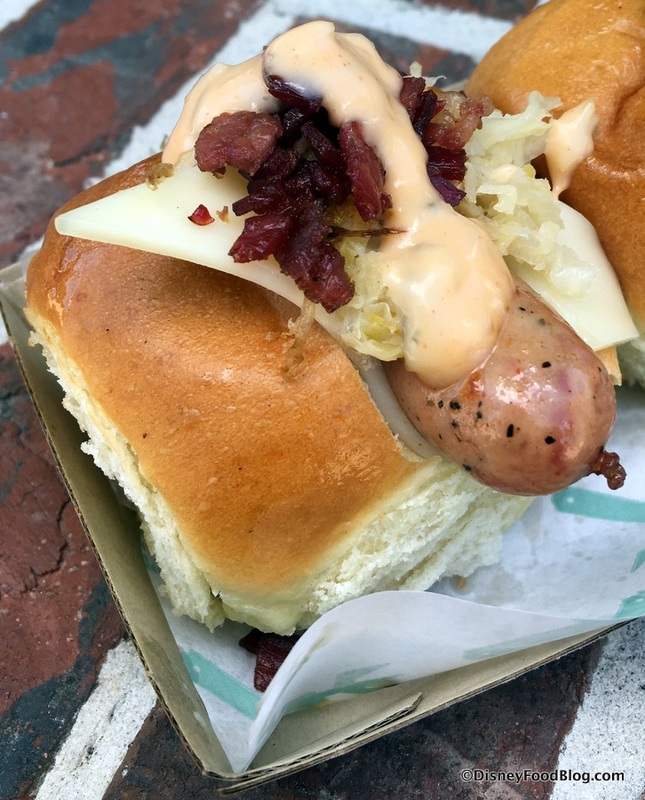 Topped with Swiss cheese, sauerkraut, braised red cabbage and a Thousand Island dressing, the sausage takes the place of the typical corned beef in a Reuben. This mini roll in particular combines the flavors I most associate with German foods like wurst. Considering the cheese and the meat, this bite is heartier than expected! I think that’s also thanks to the fresh rolls that the mini sausages are served in, which are soft and delicious (seriously, the bread is terrific). 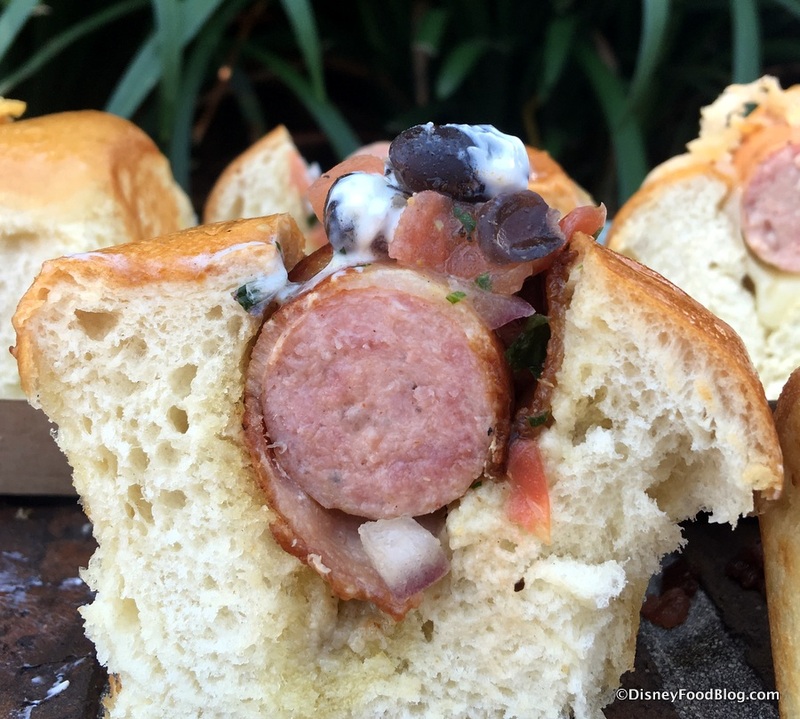 On an opposite end of the flavor spectrum is the Bacon-wrapped with Black Bean Salsa Sausage. You can spy more of the bacon below (those pigs can’t catch a break, can they 😉 ? ), lending an unexpected hint of smokiness to the southwestern flavors. The last in the Sampler is the Chili-Cheese Sausage. The name obviously references chili and cheese, but the fun surprise here is the addition of crushed corn chips on top. YUM! The layer of chili was relatively thin, but all three toppings together tasted terrific, helping what I assumed would be the most pedestrian of the three to actually top the list as my favorite! Overall, there is a LOT of taste packed in the Sampler, and each of the flavor combos is enjoyable. I found the variety to be a lot of fun… if a more than a little messy, to be honest. Unfortunately, there are no tables in the immediate area, so you’d be best off to carry your dish to one of the tables you can typically find closer to the World of Disney store. 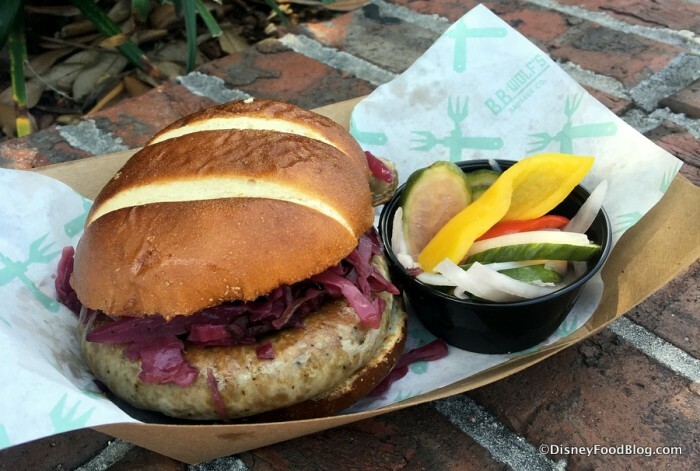 As mentioned, we just had to try the Bavarian Sausage Sandwich, too! 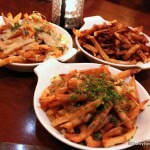 It’s also served with the housemade pickles and like the Sampler, it’s presented on fun B.B. Wolf’s logo-patterned paper. You’ll notice that the pretzel bread, in this case, isn’t topped with coarse salt, but the unique presentation and somewhat chewy consistency were still a winner with this one. 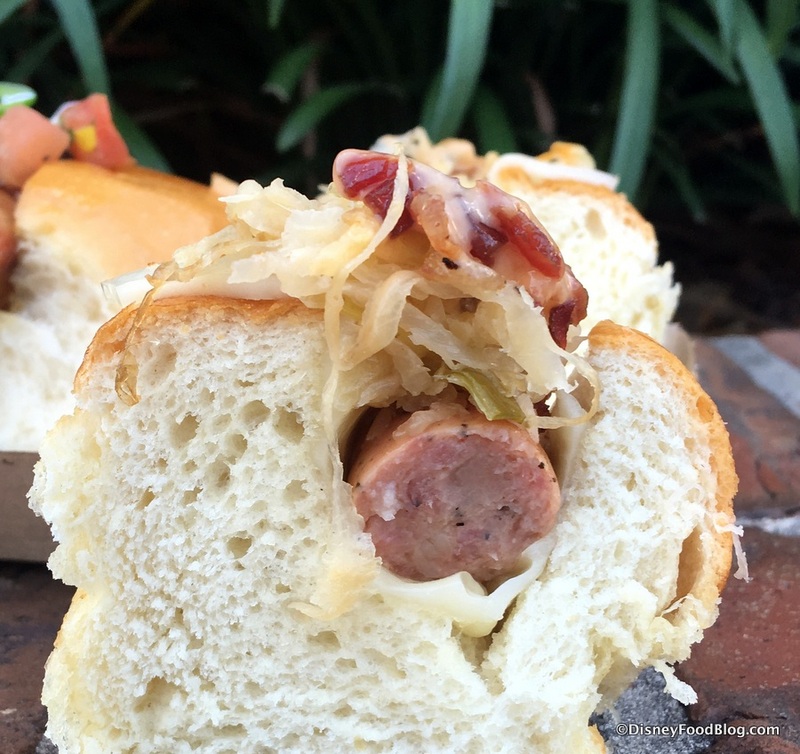 There is NO shortage of the braised red cabbage topping the generous portion of sausage. I especially enjoyed the Dijon-style mustard, even though it wasn’t at all spicy. Again, the only negative with this one is the mess factor, so stock up on some napkins and get ready for a little seating hunt 🙂 . A few logistics before we wrap up our first visit to the Big Bad Wolf’s place! Just a reminder, B.B. 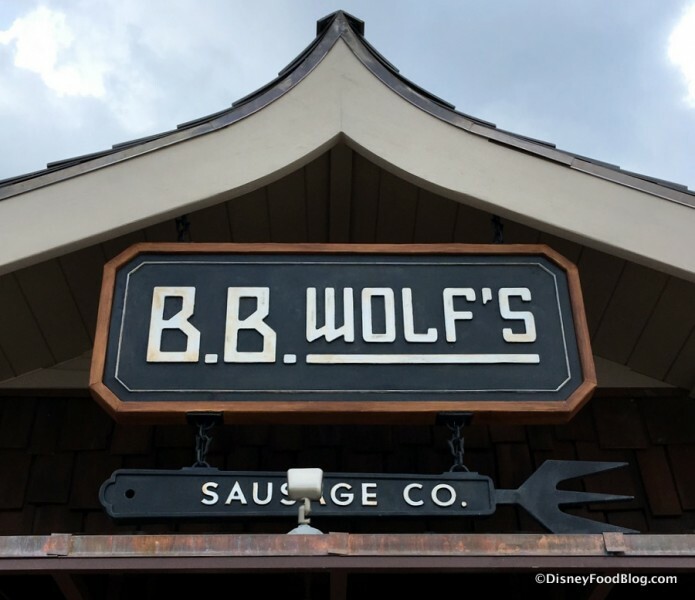 Wolf’s Sausage Co. is currently in soft openings, which means you may not find it in operation during regular Disney Springs hours until it officially opens on May 15th. B.B. 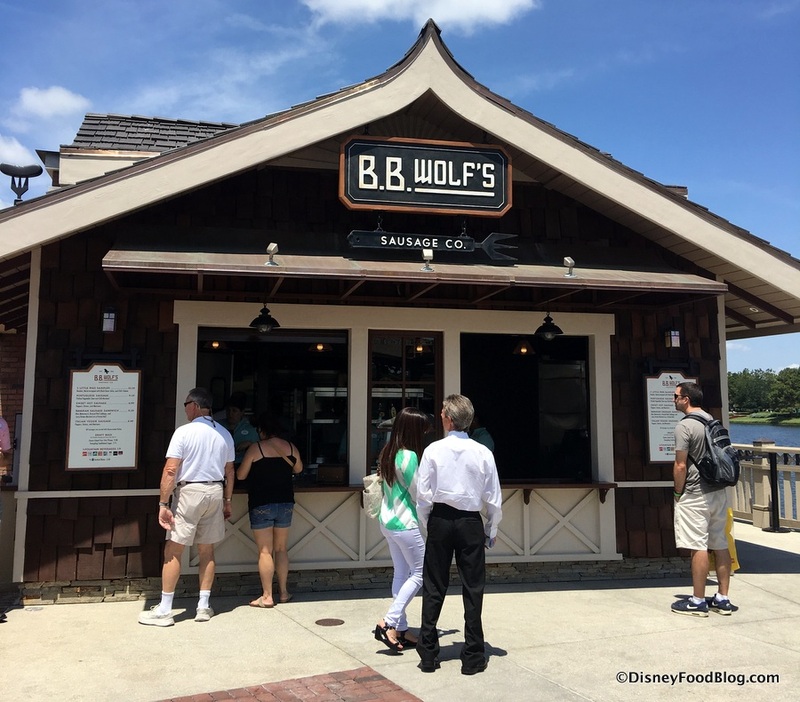 Wolf’s Sausage Co. does accept the Disney Dining Plan as a Counter Service option. 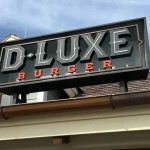 However, since they don’t offer any side items or desserts, participants in the Plan receive 2 drinks with their choice of entree at the moment. We’re guessing the menu will evolve with sides in the future. B.B. Wolf’s is definitely a fun new option for visitors to Disney Springs offering some really unique and tasty choices. 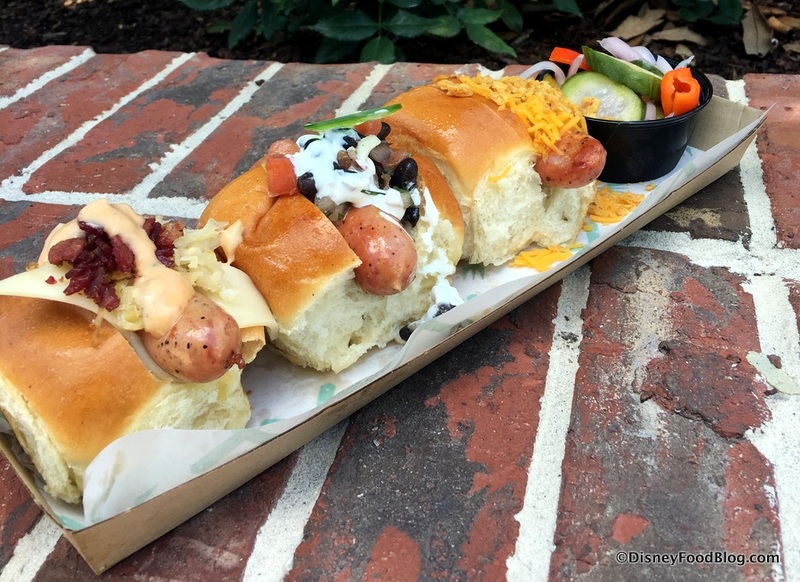 If you can’t get enough of dishes like the Frankfurter or Bratwurst in the Germany Pavilion’s Sommerfest over at Epcot, you will likely enjoy paying a visit to the Big Bad Wolf the next time you’re in Disney Springs. You may even step out of your comfort zone and try one of the twists on the classic… if you’re not too AFRAID of the Big Bad Wolf, that is! What do you think so far of the first of the new offerings in Disney Springs? Please let us know with a comment! First Look! : Pizza Ponte in Disney Springs Now Open! There are so many new places that look good, it’s going to be really tough for me because I always want my two favorites, which are EOS and WPE. The visit to the Springs will be uncomfortably STUFFING from now on! Might be a silly question – but is the Itallian Veggie Sausage a regular (meat) sausage with Italian Veggies on it? 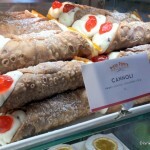 Or is it an Italian “Veggie Sausage” (a vegetarian sausage)? People use the term “veggie sausage” or “veggie dog” like they do “veggie burger”. Any idea? 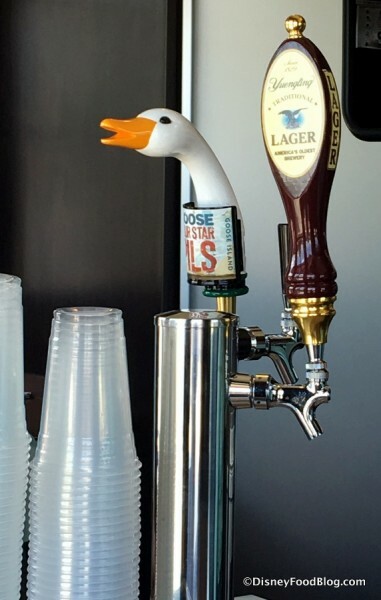 The menu really doesn’t indicate, could be confusing……. The dishes all look great, but nothing is more annoying than buying food from somewhere and then not being able to find seating! Hopefully they work on that. 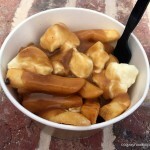 Thanks for a great review…can’t wait to get to Disney Springs and check all of it out. I was at Disney springs on the 16th after the opening. I was looking forward to tasting this booth. When I finally got there and ordered it took a long time to receive my order. The servers up front were great but the chefs were very slow. I ordered the 3 pigs sampler and I was not impressed. They really had no flavor and it was very lacking. I was very disappointed. @HB – (and any other vegetarians out there) – YAY – yes it’s a vegetarian options, they use Italian Field Roast Sausage on the Italian Veggie option. 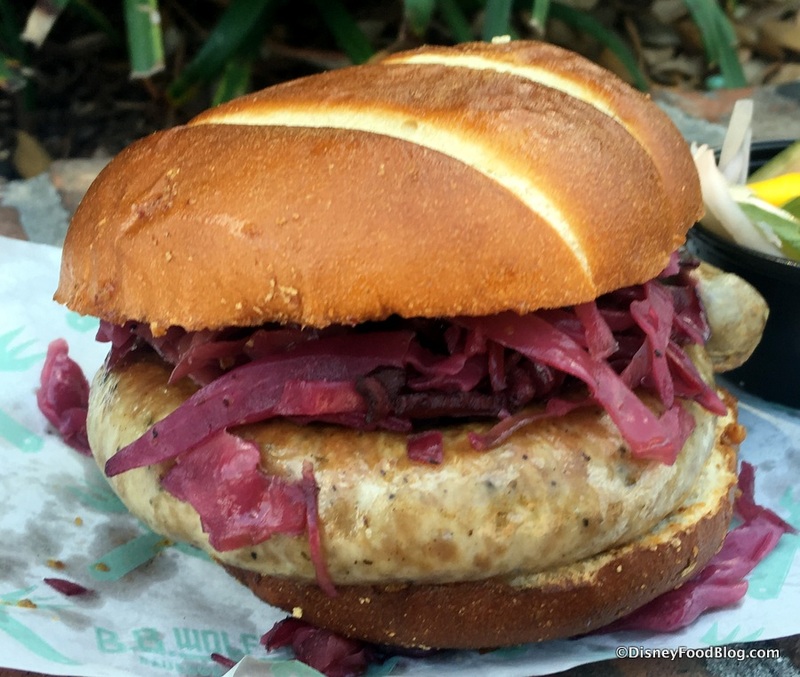 The bun is not vegan, but is vegetarian, and the field roast sausage is vegan. I’ve had the field roast sausages and they are awesome, so this is great. So happy, we have TONS of kids in my vegetarian family & extended family (self included) and this is a great quick service option for all of us. Thank you Disney!